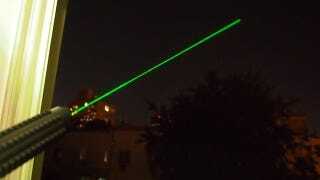 Every year laser pointers get brighter and cheaper, and every year the number of incidents involving some bozo shining one at an aircraft increases. In 2005 there were just 283 reports, but that number has increased every year, hitting an astonishing 2,836 in 2010. So the Federal Aviation Administration (FAA) has set up a website to make it easier for pilots, and those on the ground, to report when it happens.